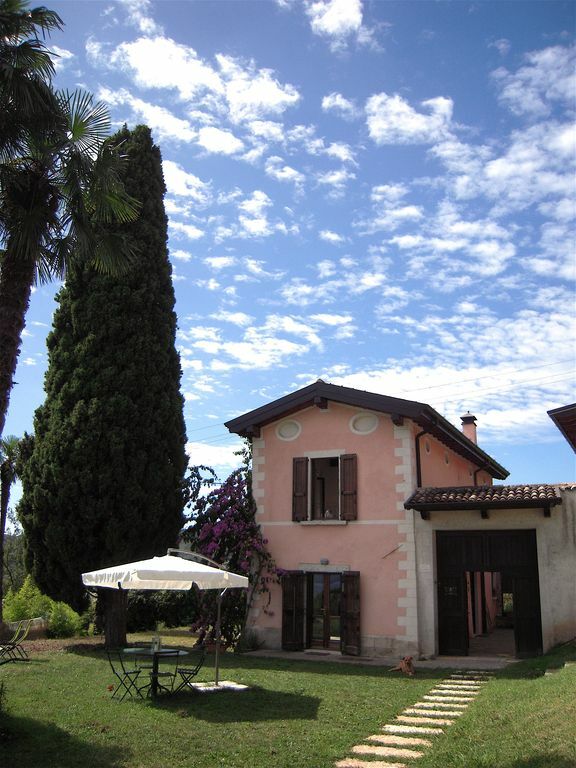 Entire independent villa of 120 square meters with breathtaking views of the Gulf of Salò! Surrounded by 12 hectares of olive groves and located within the Alto Garda natural park, the Agriturismo Valsiniga offers its guests the possibility of staying - exclusively - in an independent villa of 120 square meters, set on two floors, with exposed beams and equipped with every comfort. The structure consists of two bedrooms, two bathrooms (both with shower), large living room, equipped kitchen, large terrace and independent garden, with barbeque. The villa is located a few meters from the manor house, permanently inhabited. Privacy, however, is guaranteed: Villa and manor house have two completely independent entrances and two entrances to adjoining independent gardens. Guests can enjoy the villa and the estate in an exclusive way: the accommodation made available to them, in fact, is unique and will enjoy absolute privacy. The large terrace on the first floor, moreover, overlooking the Gulf of Salò and the olive groves adjacent to the property, provides a further corner of relaxation and privacy: there are no other inhabited facilities nearby and guests can enjoy 100% of the surrounding nature and of the unique beauty of the panorama. The farm is located on a hill and looks like a real natural terrace on the Gulf of Salò, where you can enjoy a truly breathtaking panoramic view. The inhabited center, however, is easily reachable by car, but also by bike or on foot. Particularly suitable for families with children, but also for couples looking for privacy and groups of friends who want to relax and find a bit 'of peace and serenity, away from the hectic life of every day. Your children can play freely in nature and observe the animals of our small farm, intent on their daily occupations. Particular attention has been paid to our young guests, with services designed specifically for them and also to allow parents a little 'deserved relaxation: here, in fact, you will find everything you need for the feeding and sleep of your children. From the estate there are some paths that will allow lovers of walks and excursions to know truly magical places, surrounded by greenery and quiet, but also lovers of shopping and good food will be satisfied: Salò and the surrounding areas offer the possibility to fully enjoy Italian fashion, but also our gastronomy. We will be pleased, if you wish, to let you taste our extra virgin olive oil. Our small farm, in fact, produces the famous "green oil of the garda", with a fruity and very delicate aroma, suitable for adults and children! If you come to visit us in the months of November / December you can also attend the collection in person and, if you want, take us to the mill to see with your eyes how the oil is born. Salò is just a few kilometers from wonderful museums and cities of art such as Venice, Verona, Brescia, Mantua and many others, easily reachable for wonderful outings. In short, if you are looking for a place to recharge, relax, reconnect with nature and forget about everyday problems you are definitely in the right place! Valsiniga is a magical place. It is a place of peace in the summer turmoil of Lago Garda above the lake and Saló, yet you can be in the buzz in 5 minutes or on a wonderful beach in 10. The house is simply perfect. The views are breathtaking. Valentina and her family are lovely. Rufus is a special dog soul who will make you feel sooo welcome. If I had to pick a place to live the rest of my life, this would be it :) The farm feeling is made complete by Olivia, the pig, the geese, the rabbit, the cats and the hens and chicks and roosters...For the latter prepare with earplugs, their mornig call is too early for a summer holiday - the only imperfection of Valsiniga. Dear Nora, wow!!! thank you so much!! what a great comment!! Wir haben den Aufenthalt mit Hund sehr genossen. Der Blick und die Ruhe sind traumhaft. Wunderschön. So schön kann Urlaub sein. Vielen Dank Valentina. Es hat alles gepasst. Dear Nicole, thank you so much for your fantastic words! It was a pleasure to met you and have you and Cleo as my welcome guests too! See you soon! Valentina und ihre Familie sind sehr aufmerksame Gastgeber, die wir immer kontaktieren konnten. Das Haus ist sehr schön und für eine Familie gut geeignet. Wir kommen sehr gern wieder. Alles in allem sehr empfehlenswert! Sehr schönes am Hang gelegenes Haus mit einem tollen Blick auf den Gardasee und Saló. Sehr ruhige ländliche Umgebung. Die Vermieter sind sehr hilfsbereit und freundlich und wohnen mit auf dem sehr großen Grundstück. Hund, Katze , Hühner, Gänse und Schweine gibt es auch. Dear Lutz, thank you so much! It was a pleasure to have you and your beautiful family as my guests and I hope you'll come back again! All the best for you all! Rufus. all well organized and very familiar and reserved. thank you Valentina ! a lovely place, uphill from Salo with a marvelous view. we will be back again. ein tolles Haus mit traumhafter Aussicht.Nicht weit von der Otschaft Salo entfernt.Das Haus selber ,sehr schön,sehr geräumig das einzige Mango zu wenig Geschirr,könnte etwas mehr sein,grade die Anzahl der Gläser,sonst top!! Wer Tiere mag kommt auf seine Kosten Hängebauchschwein ,Gänze,etliche Hühner freilaufender Hase,Katzen und nicht zu vergessen den ganz tollen Hund Rufus.Den hätten wir sehr gerne mitgenommen!!! The pets are welcome, but is required a fee of E 5/day. Please, ask to the owner during your booking. The pets' owners will be responsible for them and damages to the Villa, furnishings, people and others animals in the property. The price included: bed linens, bathrooms and kitchen towels and their weekly changing too, services for baby (ask to the owner), electricity, water, parking, garden using - exclusive - , unlimited wi fi, tv. The check in is from 3p.m. to 8 p.m. In case of later check in: € 50 extra fee. No later check out or early check in. Early departure does not warrant any refund of rent. Heating (from October 15th to April 15th and according to guests' necessities or weather): E 150/week.